First published in 1982, this work builds on the detailed economic history of Brazil in its companion volume: "Economic Structure and Change, 1822-1947", assessing and challenging the established interpretations. 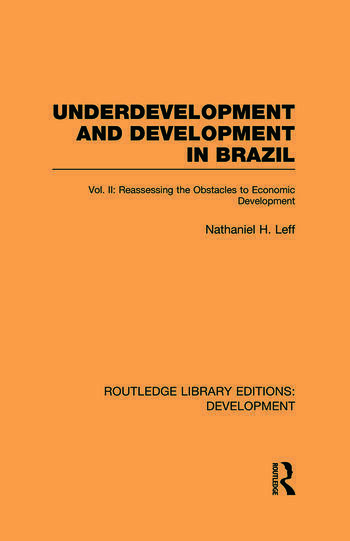 The book covers in depth the causes of the Northeast’s poor economic experience and the emergence of significant regional inequality in Brazil’s development. In his analysis of the role of Government in Brazil’s economic development, the author offers a fresh perspective on the importance of public finance constraints and on the tensions between centralisation and federalism. The study also deals with broader analytical interests, affording opportunity to examine the empirical relevance of long-term development models. In encompassing both the period of slow economic growth through much of the nineteenth century and the rapid economic development which began at the end of the century, the study is able to focus upon the conditions which led to the onset of sustained development in a major underdeveloped country, suggesting lessons for contemporary underdeveloped countries.